Who are we, the South African Waste Pickers Association? We, the South African Waste Pickers’ Association (SAWPA) are an affiliation of waste pickers working on more than 70 waste dumpsites (also referred to as landfill sites) and on streets throughout South Africa where our jobs provide us with an income to put food on our tables, clothe and educate our children, and provide us with the dignity that meaningful employment offers people. We have come together today to object the proposal by EnviroServ to construct a waste incineration facility at the Chloorkop waste site. 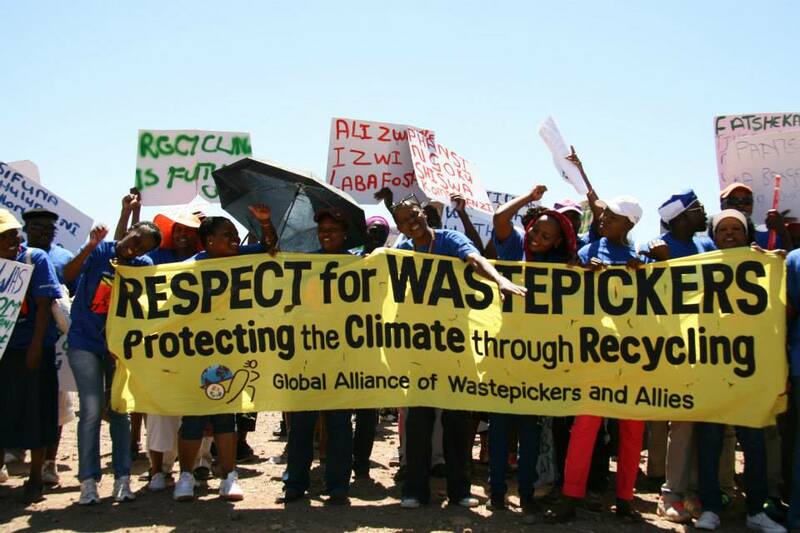 We call on government to deny EnviroServ permission to build a waste incinerator facility at Chloorkop. Waste incinerators represent a failure of good waste management practices and will take away jobs and livelihoods from South African waste pickers. South Africa’s waste management legislation, the Waste Act of 2008 stipulates that incineration must be the last resort in the waste management cycle after waste separation at source, materials recovery and recycling options have been tried and tested. We organise collectively and democratically as the SAWPA in order to have a voice that can be heard in a democratic South Africa. This has been strengthened through many provincial meetings and three national meetings since June 2009, where we have discussed issues that affect us and we have planned and subsequently implemented these plans of actions. We are presently finalising our national constitution, and have developed along with our ally groundWork, Friends of the Earth South Africa, “A Waste Picker’s Guide to Organising” in four of our South African languages. We have a history that links us to one another in South Africa as well as waste pickers throughout the world. Our members have visited and worked with waste picker organisations and waste pickers in Pune, India; Cairo, Egypt; and São Paulo, Brazil where they have shared experiences and work methods that have assisted in the development of our movement in South Africa. We have strong relationships with global organisations such as Women in Informal Employment: Globalising and Organizing (WIEGO), the Global Anti-Incineration Alliance (GAIA) and Friends of the Earth International (FoEI), with whom we work to ensure that there is a strong African voice in the global movement of waste pickers, where waste pickers are demanding the right to be allowed to work in the places they choose and that their labour is controlled by themselves rather than major multi-national corporations or private interest. Our history lies in a struggle to be recognised by government, industry and the people of South Africa. Our history lies in brutal oppression – which is still found in some places – where we were whipped, shot at and chased off and excluded from our places of work at the waste dumpsites where we collect recyclables for an income. In 2013, the Ministry of Environmental Affairs (DEA) visited SAWPA partners in Brazil and Columbia to learn about inclusive solid waste management and the waste pickers’ movements in these countries. We have made our history a positive one through the slow and deliberate building of our association. We have, through our work, taken materials out of the waste cycle therefore ensuring that there are less toxins being dumped in the environment. We have, through our work, of recycling plastic and metals, reduced the need for virgin materials such as coal, crude oil, gas and metals and thereby made a huge impact in the reduction of greenhouse gases by ensuring that society can keep ‘coal in the hole’, ‘oil in the soil’ and ‘gas in the land’. We have, through our work, offered government and society a way out of the destructive practice of mining that results in the destruction of people’s lands and makes society poorer. Waste-to-energy incinerators are a source of dirty energy. Waste incinerators in the EU continue to pollute the climate and cause significant public health risk, while burning billions of dollars-worth of valuable, non-renewable resources. Modern incinerators in the EU are a major source of ultra-fine particulate emissions. In 2009, the SITA Cornwall waste company was banned from distributing information on incineration for, among other things, making unsubstantiated claims that the UK Health Protection Agency stated that modern incinerators are safe. If material is not recycled, more finite, fossil-fuel based resources need to be extracted to produce more goods which drives climate change. According to the U.S. EPA, “waste to energy” incinerators and landfills contribute far higher levels of greenhouse gas emissions and overall energy throughout their lifecycles than source reduction, reuse and recycling of the same materials. Incineration also drives a climate changing cycle of new resources pulled out of the earth, processed in factories, shipped around the world, and then wasted in incinerators and landfills. To develop local government capacity throughout South Africa to engage with waste pickers in a meaningful and supportive manner to ensure waste management is sustainable and builds livelihoods rather than destroys people’s income. We respectfully request government to respond to our concerns within 30 days. Tellus Institute, More Jobs, Less Pollution: Growing the Recycling Economy in the United States, 2011. www.recyclingworkscampaign.org. Howard, C.Vyvyan, Statement of Evidence, Particulate Emissions and Health, Proposed Ringaskiddy Waste-to-Energy Facility, June 2009. UK Without Incineration Network: Burner Booklet Banned, July 2009: http://ukwin.org.uk/. U.S. EPA, “Solid Waste Management and Greenhouse Gases, A Life-Cycle Assessment of Emissions and Sinks 3rd edition,” 2006.